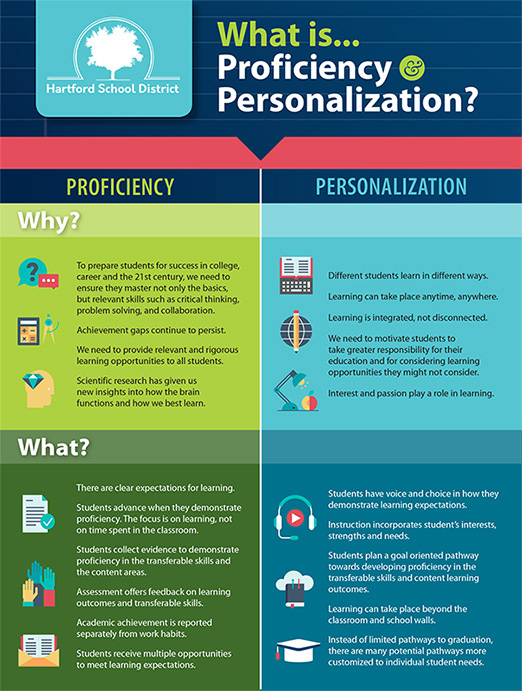 The Hartford School District uses Proficiency Based Learning to ensure a quality education for all students. To prepare students for success in college, career and the 21st century, we need to ensure they master not only the basics, but relevant skills such as critical thinking, problem solving, and collaboration. In order to achieve our ENDS Policies, the district has identified Proficiency Based Learning Outcomes which include both Transferable Skills and Content Proficiency Based Outcomes (PBLOs). 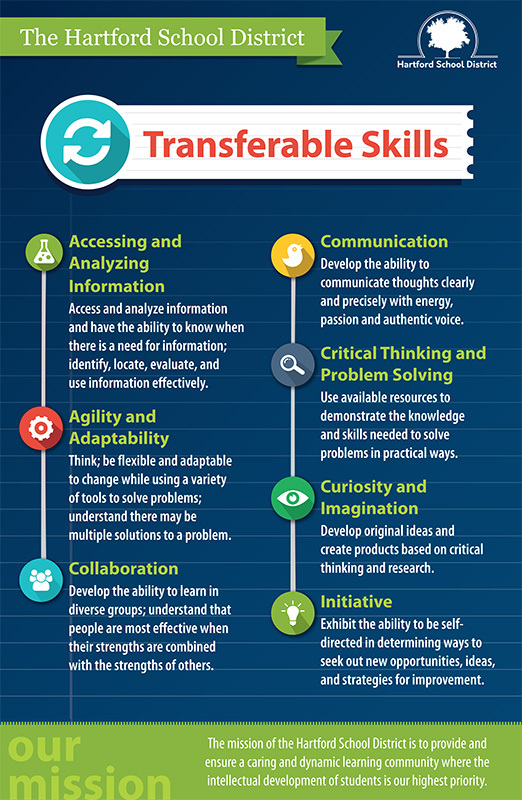 There are seven key Transferable Skills at which all students will demonstrate proficiency by the time they graduate. These skills are ones that students will need to be successful in life after graduation. They are: Agility and Adaptability, Access and Analyzing Information, Collaboration Across Networks, Communication, Critical Thinking and Problem Solving, Curiosity and Imagination, and Initiative. 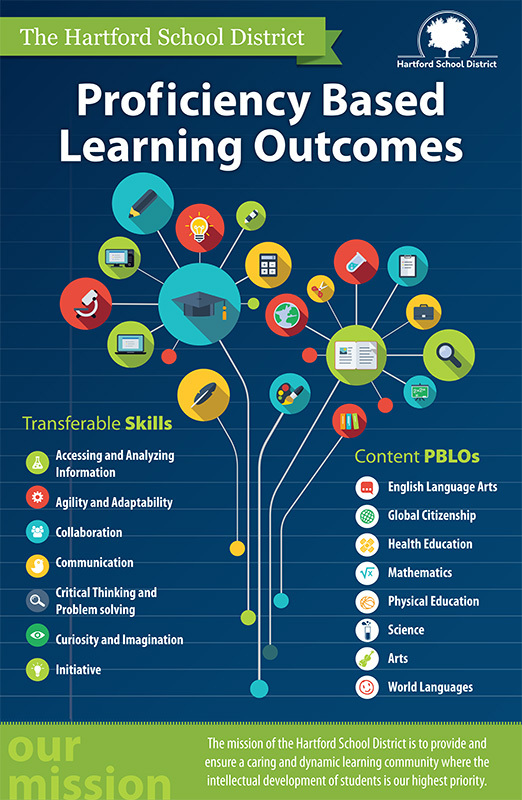 To ensure our learners have the content knowledge, understandings and skills they will need to succeed in our global society, the district has defined Content Proficiency Based Learning Outcomes (PBLOs) for each content area and grade level. These reflect the most foundational core ideas, concepts or strands represented in the National Standards for each content area. They remain constant from kindergarten through twelfth grade although not every content PBLO is assessed at every grade level or within each course. Within these content PBLOs we have Performance Indicators, to further delineate each outcome. Performance Indicators vary by grade level/grade cluster or content area (depending on grade). They were developed by teachers at the district level and are based on the content area and grade level National Standards. Teachers and students use the indicators to help ensure students are on-track for meeting the learning outcomes. Learning Targets further describe the components of each indicator. For day-to-day instruction, teachers create their own Learning Targets, used to guide student acquisition of knowledge and skills. They are developed with each of the above levels in mind and further break down the learning into a series of progressive steps based upon National Standards. Use the menu on the left to explore the Transferable Skills, PBLOs, and Performance Indicators for each grade level and content area.